DuPont Teflon is a brand name your customers trust and Teflon Advanced is one of the finest carpet protectors on the market. Teflon Advanced and Teflon Advanced for Wool are fluorocarbon water-based products specially designed to protect carpets from wet and dry soils. They are both CFC and solvent free. There is no quality protector on the market with more repellency than Teflon Advanced and your customers will be highly impressed when spills bead up on the carpet surface allowing them to be removed before wicking and staining occur. Teflon Advanced also has improved protection against oil and water based spills and outstanding dry soil resistance so carpets look great year after year. 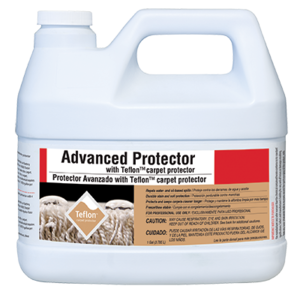 Teflon Advanced is great as part of a two protector sales system. Lasts for a year or two , best I've ever used . Q: Hi, How is this solution applied to carpets? Does it require a special machine or can it be done from the bottle directly? A: We recommend using a pump sprayer. Q: Is there a difference in effectiveness among carpet protectors and between DIY and commercial applications? A: The professional products contain more solids than the consumer products.